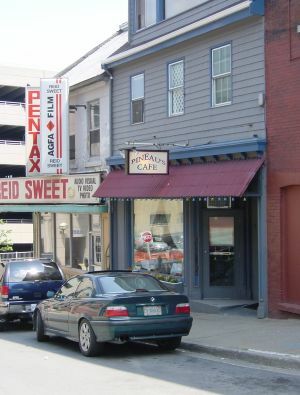 Pineau's Cafe was the gay restaurant in Halifax in the 1990s. This is not exaggerating; it was the only one. The takeout menu read, "A relaxed and intimate dining room offering generous portions at reasonable prices." There is a mention of it first opening in Wayves correspondence in September 19961, suggesting a possible review in the October issue. Pineau's closed in March, 2007. It was at 5190 Blowers Street, just below Barrington and is wheelchair accessible, fully licensed, and air conditioned. CapnDan writes: "Good prices, good queer service, nice atmosphere for business or a date. The proprietor, AlanPineau, is a major supporter of queer events in the city." Philip The Waiter says, "The single most popular thing, quoted by Gourmet Magazine as 'Can't be beat' is our Fish and Chips. Other popular menu items are the Panfried Fresh Haddock, the Seafood Chowder, and the Spinach Salad." Fish And Chips Made with fresh haddock. Served with fresh cut fries and coleslaw. 1 piece $7.00 / 2 pieces $9.25.